Board mounted: Any portion of a treatment that is mounted on a board inside or outside of the window. 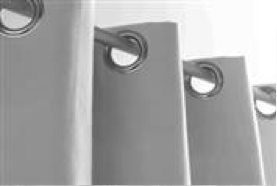 Casing: A pocket made in fabric for a curtain rod, weight board, or drawstring. 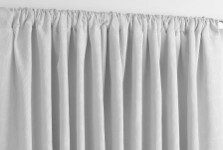 Curtain drop: The total length of the curtain from the top of the hanging system to the bottom hem edge. Clearance: The distance from the back of the rod, pole, or mounting board to the wall. 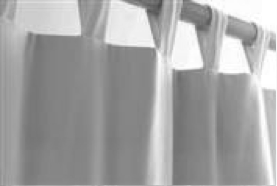 Curtain: A lined or unlined finished panel of fabric that is hung from a non-traversing rod at the top of a window. 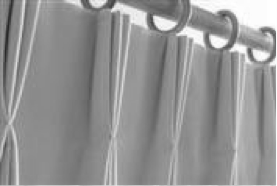 Double-hung draperies: Two sets of draperies, usually a sheer fabric under an opaque fabric, both operating separately. 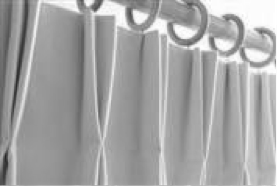 Drapery: Full length, lined, pleated or un-pleated panels that open and close on a drapery track or rod. Dressing: The process of folding and manipulating the fabric of a treatment after it has been hung, to create the desired effect. Drop length: The distance from the top of the object to where you want the fabric to end. Face: The right side of the drapery treatment. Fullness: The amount of fabric used in relation to the finished width of a drapery, usually between double (2x) and triple fullness (3x). 2x indicates the flat fabric is twice as wide as the finished drapery, 3x indicates it is three times as wide. 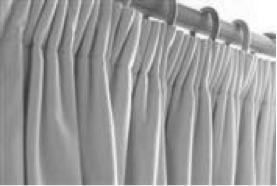 Heading: The heading refers to the top hem of treatment. Its description refers to the type of construction used in the top hem, i.e., pinch-pleated heading, smocked heading, or tab-top heading. Hem: To turn under and stitch a raw edge. Also refers to any finished edges of a treatment. Mounting board: A wooden board installed inside or out of the window frame to which curtains, valances, or other treatments are attached. 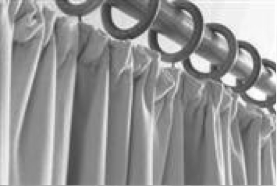 Return edge: The outside hem of top treatments, drapery, or curtain panels that makes up the return of the treatment. Overlap: The portion of fabric that overlaps (crossover) in the middle of a pair of draperies when they are closed; when two swags crossover each other on a board or pole, that is the crossover or overlapped area. Pair width: Rod width plus one overlap and two returns. This is a measurement you would get if you took two panels of a pair of pinch-pleated draperies and you laid them down end to end widthwise, not overlapping. When closed, the draperies should hug the traverse rod. 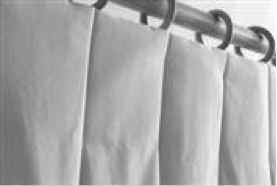 Panel: One-half of a pair of draperies or curtains, even though it may consists of several widths of fabric. Panel width: The pair width divided by 2. This is the finished width of a panel of draperies. Pleat: A fold of cloth sewn into place to create fullness. Pleat to: A finished width of the fabric after it has been pleated. Pleat to pleat: The measurement from the first pleat to the last pleat. Projection: The distance from the front of the window treatment to the wall. Puddle: Formed when drapery panels are long enough to literally lie on the floor. Extra length must be added from 1’’ to 18’’, depending upon the effect desired. 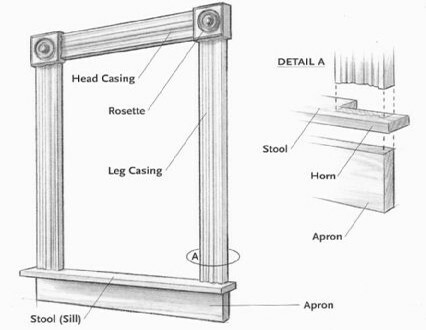 Return: The distance from the face of the rod to the wall or casing where the bracket or board is attached. Sheers: Curtains or draperies made of translucent fabric to filter light and provide minimal privacy; often used under another drapery. Stack back: The amount of space taken up by a drapery or shade when they are completely open. Total width: The width of the board or rod, end to end, plus two returns.